Christians are being called to join a week of prayer to support and raise awareness for all those affected by the criminal justice system. Prisoners, their families, victims of crime and prison staff are among those who will be prayed for this week (16-22 November) as Prisons Week celebrates its 40th year. 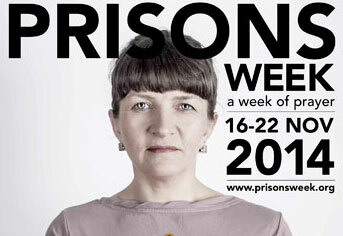 Established in 1975, Prisons Week is run by a broad alliance of Christian denominations and leading faith-based charities working in the criminal justice system. This year, its focus is on building hope; reflecting the lectionary readings for Prisons/Prisoners Sunday and the desperate situation for many of the individuals and institutions involved. With prison populations more than doubling in the last 20 years, suicides rising 69% in the last year and a reported 30% decrease in prison officers in the last three years, these are uniquely tough times for all those involved in the criminal justice system. A Prisons Week spokesperson said: “The Prison Service is facing huge challenges with record populations of more than 85,000 and many prisons suffering from overcrowding. “There has also been a 37% surge in serious assaults on prison staff working in these demanding conditions. The figures speak for themselves and we need to reduce the levels of distress and despair within the system ‒ by building hope. Special services will be held throughout the week and there will also be a seminar at Westminster Central Hall on Friday 21 November about the over-representation of black people in prisons, hosted by Churches Together’s Bishop Joe Aldred and Free Churches Faith Advisor to NOMs and Chaplain Rev Bob Wilson. This year’s Prisons Week was launched last month at Westminster Central Hall with speeches from Prisons Minister Andrew Selous MP, Fiona Bruce MP and Anglican Bishop James Langstaff.